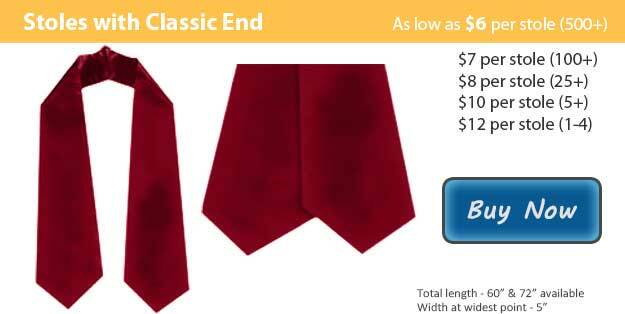 As your school celebrates the achievements of its graduates, complete the distinguished apparel with maroon graduation stoles from Honors Graduation! These beautiful stoles, or sashes, are made from high quality crepe back satin, and their color hues can be closely associated with burgundy, garnet, and crimson. Not only will they stand out in appearance over your gown throughout your ceremonies, but they will be sure to last for years to come as treasured mementos as graduates look back on such an important day in their lives. At the same time, you can know that these premium quality honor stoles come at an affordable price that won't break the budget, particularly when you take advantage of our bulk discount deal! Maroon graduation stoles may be used for several reasons. One common use might be to show student achievement in high academic honors, especially in conjunction with honor cords. It might also indicate achievements in particular programs such as International Baccalaureate or the Conservatory of Fine Arts. Additionally, you may choose to use honor stoles in the "stole of gratitude" commencement tradition. In this custom, all students wear their honor stoles throughout the graduation ceremonies. Afterwards, they present their stoles to an individual who has served as a mentor and inspiration throughout their education. Schools that use maroon, burgundy, or garnet in their school colors include the following: Alabama A&M University, Boston College, Florida State University, Mississippi State University, Missouri State University, the University of Chicago, and the University of Minnesota. It's also used by various Greek honor societies and sports organizations. Maroon clearly makes its appearance across academia and extracurriculars, so be sure to look into whether maroon honor stoles would fit your school's graduation needs! Place your order with Honors Graduation today, and remember to check out our bulk discount deals!